On song that was popular when I was in late elementary school was Len’s, “Steal My Sunshine.” In the intro of the song, they talk about cheering Marc up. At the end it’s asked if he likes butter tarts. I never really knew what they were, but just as I discovered with pepperoni in Canada, they are very much a Canadian thing. 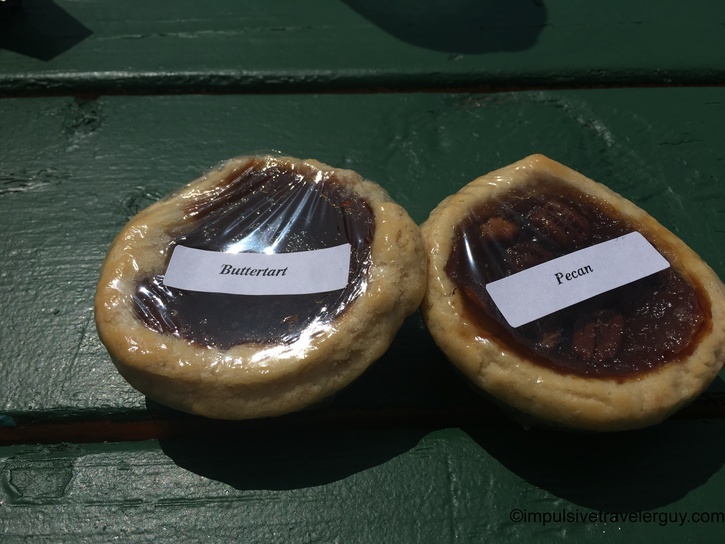 When I was looking for local products and posted on the Thunder Bay Memories group, many people suggested I try butter tarts. I knew they were some kind of dessert item, but after doing a bit more research, I found out they consist of butter, syrup, sugar, eggs, and are contained inside a flaky outside that is shaped kind of like a cupcake without the fluffy top. Many of them have additional ingredients like pecans, walnuts, or raisins. When I went to George’s Market, I picked up some butter tarts and that’s what’s shown in the picture above. I actually didn’t get a chance to eat them until I was on the road to Toronto and had stopped at a rest stop along the way. I was hungry and decided these would be a good snack. I’ve never been a big sweets guy. Most of the time I’d load my plate up with meat and cheese (my favorite 2 food groups) and be so stuffed, I rarely ever ate dessert. I also never liked cereal as a kid because it was too sweet. While butter tarts are sweet, there’s a lot more depth to them and the syrupy texture of the inside is very good. Maybe it’s the butter and eggs that make me like these. I’m guessing the closest thing I can find in Texas is the mini pecan pies they sell at a place like Berdoll’s. Maybe I’ll stumble across these somewhere outside of Canada in the future and have to try that version. I really don’t seek out sweets too much, but I think next time I’m in Canada, I might get another butter tart or two and have a proper dessert (although that would require a bit of restraint on the meat and cheese).